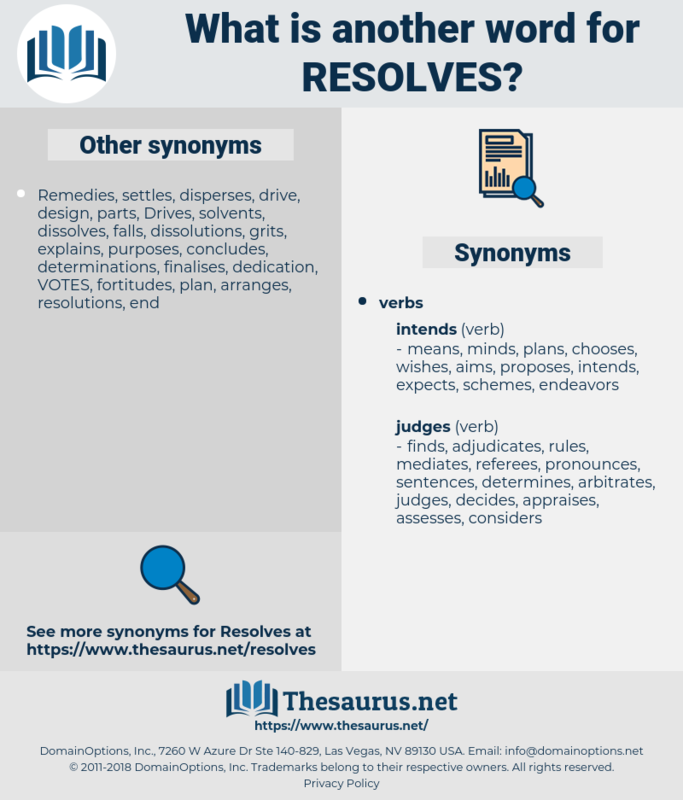 What is another word for resolves? 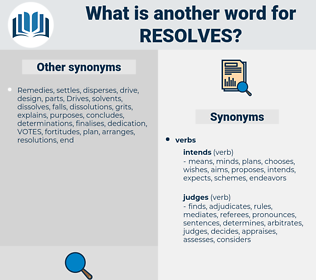 resolutions, solving, Remedies, declares, agrees, fixes, determines, orders, decisions, converts, deals, rule, rules, affirms, undertakes, elects, rulings, Shots, sets, Sons, changes, decides. removes, resolution, responds, redresses, approves, governs, resolutions, rectifies, serves, corrects, strives, saves, envisions, Replies, determinations, adjudicates, regulates, eliminates, handles, answers, achieves, delivers, selects, treats, foresees, heals, asserts, cures, proceeds, concludes, covers, testifies, fulfills, advises, establishes, defers, splits, assesses, contrasts, contemplates, disposes, identifies, adjust, adjusts, troubleshoots, fulfils, fills, triggers, chooses, persists, caters, corresponds, contends, specifies, honours, satisfies, concurs, complies, predicts, anticipates, ends, assigns, provides, directs, alleges, stipulates, declares, agrees, divides, shapes, separates, submits, fixes, modifies, determines, defines, adopts, conforms, prescribes, OPTS, pays, dictates, argues, Faces, creates, decisions, intends, deals, passes, wishes, envisages, tries, rule, rules, holds, rides, suits, turns, affirms, takes, expects, elects, says, fits, meets, sets, finds, gets, Does, wants, makes, decides. dissolves, overcomes, Addressing, Addresses, tackles. For long now I have had two fixed resolves. And then it was so seldom that anyone came to talk to her, that she was tempted to fall away from her high resolves. Rea Silvia, roach clip, rock wallaby, Rhea Silvia.